October was an up and down month for me. At the beginning it was so intense and busy. And then in the later half of October I got to really relax and catch up on work. October was, I feel like, an exceptionally good reading month for me. 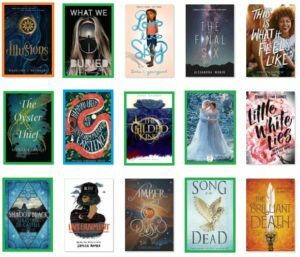 I have started to get more on top of my backlist Netgalley books, or just my e-arcs in general. Now that the pressure to read physical ARCs isn’t there. I can be better about my schedule. And that makes me so happy. And it decreases my anxiety and stress in general so that’s just a whole lot of fabulous here. I finally finished Written in Red which I have been struggling with for a while. Not because I didn’t like the book, but because the pace of the book was so slow, and so was the narration. I was listening to this on audiobook. I also finished the Wish Quartet series and was able to review Age of Magic. And now I can start thinking about reading Elise Kova’s Air Awakens series. Which I own all of them, but just haven’t read it yet! I was also able to start reading some of my most anticipated 2019 releases – Shadowglass and Song of the Dead. In general I’ve been trying to structure my weeks by reading 2 e-ARCS, 2 for reviews, and 2 for 2019. I never want to be so behind on upcoming books. I mean I know I probably will be again….but here’s to hope right? 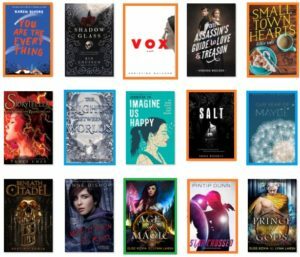 Favorite new to me authors: Our Year of Maybe and I’ll be interviewing Solomon later this year, so look forward to that! Favorite Fantasy: The Storyteller & Song of the Dead & Shadow Glass feels like cheating because we all know I was going to ADORE those books to pieces, so I’ll pick a second which is Beneath the Citadel which could totally qualify for the first category since I haven’t read Iron Cast yet…. Favorite Contemporary: Small Town Hearts! You need to add this book to your list for next year! Biggest surprise: Little White Lies I mean I didn’t eat until I was finished with this book. It completely captivated me. How was your October reading month? Awesome wrap-up!! Have a great November! Thank you! How was your October?? Sounds like it was a great month! It was certainly a good reading month!